Born to Cuban immigrants on January 1, 1954 in New York City, Bob Menendez earned a BA in politics from Saint Peter’s College (New Jersey) in 1976, and a JD from the Rutgers University School of Law in 1979. He was admitted to the New Jersey Bar in 1980 and promptly opened a private legal practice. From 1974-78, Menendez was a member of the Union City, New Jersey board of education. In the late seventies, he began working for that town’s Democratic mayor, William Musto, whom he viewed as a political mentor and father figure. But Menendez eventually quit that job and testified against Musto in a 1981-82 corruption trial that saw his former employer convicted and sentenced to seven years in prison. Menendez went on to serve as a representative in the New Jersey House from 1988-90; mayor of Union City from 1986-92; a New Jersey state senator from 1990-92; and a member of the U.S. House of Representatives from 1993-2006. When Jon Corzine in January 2006 resigned from his U.S. Senate seat (representing New Jersey) in order to begin his tenure as the state’s newly elected governor, he appointed Menendez to take his place in the Senate for the remainder of that year. In November, Menendez won a general election for that same Senate seat, and he was re-elected in 2012. Widely regarded as a highly effective fundraiser, Menendez has raised millions of dollars for a number of Democratic political candidates—particularly Latinos—since 2000. According to the Washington Post, “Menendez has tried to position himself as the ‘Democratic Party’s conscience on immigration.’” Toward that end, Menendez in 2004 proposed legislation that would have allowed many illegal immigrants to apply for permanent guest-worker status or citizenship. That same year, he co-sponsored legislation with Senator Ted Kennedy that would have tightened restrictions on the manner in which law-enforcement officials could conduct immigration raids, but the bill never reached a vote. In 2006 Menendez backed the broad “comprehensive immigration reform” plan that was never signed into law. And in 2008 he co-sponsored legislation that would have given illegal-immigrant high-school graduates a six-year window to become eligible for citizenship by either earning a college degree or serving in the military, but the bill did not make it out of committee. Today Menendez favors a path-to-citizenship requiring illegal immigrants to pass a series of benchmarks such as paying a monetary fine and learning English. From 1993-2003, Menendez, as a landlord, rented out office space to a Union City nonprofit agency, collecting some $300,000 in rental fees during that period. In 1998 he assisted the same agency by persuading the Department of Health and Human Services to designate it as a federally qualified health center, thereby expanding the agency’s eligibility for federal grants (of which it received some $9.6 million worth during the ensuing eight years). Menendez stated, accurately, that he had rented his Union City property to the agency at (slightly) below-market rates; but his claim that he had not profited from the deal was false. In September 2006 a psychiatrist named Oscar Sandoval, who held some $1 million in government contracts to provide psychiatric services to a number of Hudson County, New Jersey public facilities, released a set of tape recordings from 1999 that implicated Menendez in serious corruption. On the tapes, Menendez’s close friend and fundraiser Donald Scarinci, a powerful attorney professing to speak on Menendez’s behalf, asks Sandoval to hire Dr. Vicente Ruiz (a staunch Democratic Party supporter with ties to Menendez) or face the prospect of losing all of his government contracts. Scarinci can be heard saying that “Menendez will consider that a favor” which would earn “protection” for Sandoval. As soon as the tapes were made public, the Menendez campaign cut its ties with Scarinci and denied that the latter had been acting on Menendez’s behalf. 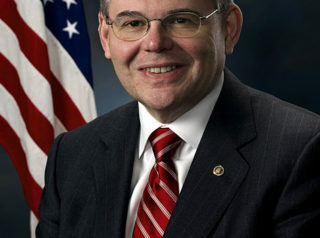 In 2010 the Wall Street Journal reported that Menendez had written to Federal Reserve chairman Ben Bernanke, asking him to approve the Crown Bank of Brick‘s acquisition of the failing New Jersey-based First Bank Americano (FBA), whose chairman and vice chairman were both major Menendez donors. (That acquisition, had it been approved, would have prevented the two executives from losing whatever was left of their investments in the bank.) All told, 8 of FBA’s 15 directors had given money to Menendez or his political action committee. Former federal bank regulator William Black, a Democrat, called Menendez’s letter “grotesquely inappropriate” insofar as it directly asked regulators to approve an application, rather than to simply place it under consideration. A scathing FDIC report indicated that FBA had engaged in numerous unsafe or unsound banking practices over the years, and the acquisition ultimately was disallowed. In early 2013, Menendez was one of the “Gang of Eight” U.S. senators (four Democrats and four Republicans) sponsoring Senate Bill 744, known as the Border Security, Economic Opportunity, and Immigration Modernization Act. This bill called for the provision of a path-to-citizenship for most of the estimated 11 million illegal immigrants already residing in the United States; an expedited path-to-citizenship for illegals who first entered the U.S. as minors; a doubling of the number of future legal immigrants permitted to enter the U.S. from Mexico; and a continuance of the practice of “birthright citizenship,” whereby American citizenship is automatically granted to babies born in the United States regardless of the parents’ legal status. In March 2014, Menendez praised a Department of Homeland Security edict directing 21,000 U.S. border patrol officers to: (a) retreat and seek cover, rather than discharge their weapons, whenever illegal immigrants threw rocks at them; (b) keep their weapons holstered whenever drug smugglers were driving by or fleeing from the agents; and (c) avoid (on pain of penalty) making any effort to block the path of a vehicle being used in suspected wrongdoing. On April 28, 2017, Melgen was convicted on all 67 counts of Medicare fraud which had been brought against him. In November 2017, Menendez’s federal corruption trial ended in a mistrial after the jury reported that it was hopelessly deadlocked. In January 2018, the Department Of Justice filed a notice that it planned to re-try Menendez on bribery and corruption charges. But less than two weeks later, the DOJ reversed itself and dropped its case against Menendez. For an overview of Menendez’s voting record on an array of key issues, click here. For additional information on Bob Menendez, click here. In addition to his work as an ophthalmologist, Melgen also manages a Florida company, Border Security Services LLC, which in 2011 purchased I.C.S.S.I., a port-security firm that had been providing X-ray screening at Dominican ports since 2002. (That port contract was worth an estimated $50 million per year, and the Dominican government had recently begun to express a desire to terminate the contract due to the high costs.) Columnist Michelle Malkin writes: “Menendez used a Senate hearing [in summer 2012] to lobby for enforcement of the contract Melgen’s company ha[d] with the Dominican government. Menendez also met with officials from the Obama State and Commerce departments on the matter, though he was careful not to mention Melgen by name. One of Menendez’s longtime senior legislative aides, Pedro Pablo Permuy, [was slated to] be in charge of operations …” For a detailed timeline of the Melgen-Menendez Dominican port security deal (and its historical context), click here. 2 Senate rules require prior approval of such private jet travel and luxury lodging, and financial disclosure of such gifts after approval.